The entire scope of a project is illustrated in this case study– the step-by-step process of how creative and analytical approaches are used to visualize, develop, communicate and actualize a solution. In 2008, I was commissioned by a parish in St. Paul Minnesota to design and build a series of new altar vessels in the Arts & Crafts style. 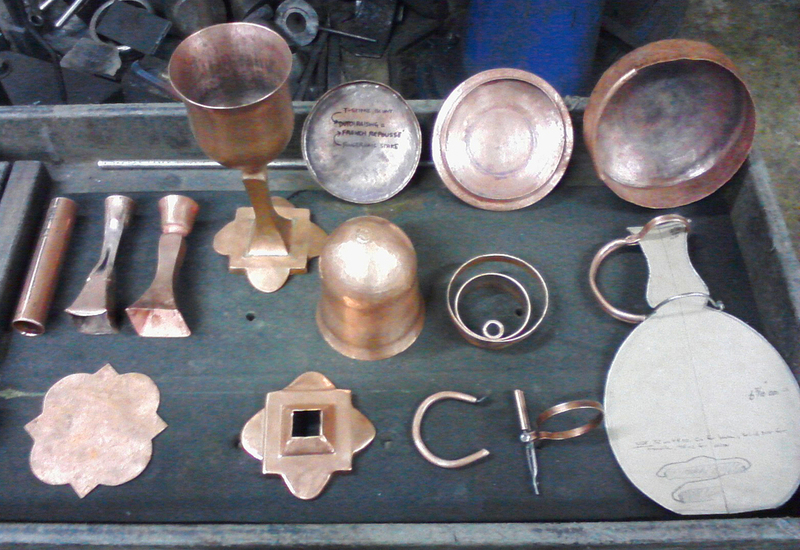 A total of nine pieces were hand wrought in copper and plated with sterling silver including four chalices, three patens, a ciborium and a decanter. 1. I began by meeting with the liturgy committee and identifying what they wanted by using their current vessels as the departure point. We discussed the ceremonial role of each vessel, the interaction, and the physical attributes such as weight, size, shape and capacity. One of the most compelling requests was that the chalices be suitable for people with small or weak hands– a principle that would end up governing all of the vessels. This pushed me to investigate how shape influences grip and how texture can be applied to promote grip. Following each meeting, I would immediately sketch ideas to digest the feedback and generate options. 2. Vessels have been essential to survival and sacrament for thousands of years; continually made, adorned, used, and revered. There is no limit to the depth of research into the history of a cup or container. Some rare examples were discovered in auction catalogues, appraisal books, and sources pertaining to the grammar of ornament. 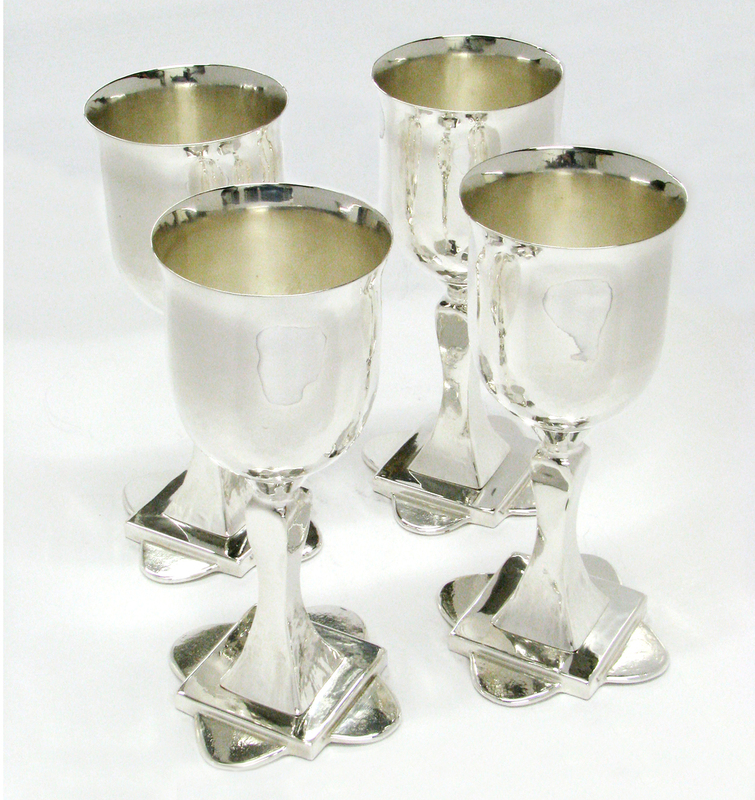 I also researched liturgical vessels that are currently mass produced and vessels that are custom made by silversmiths today. 3. 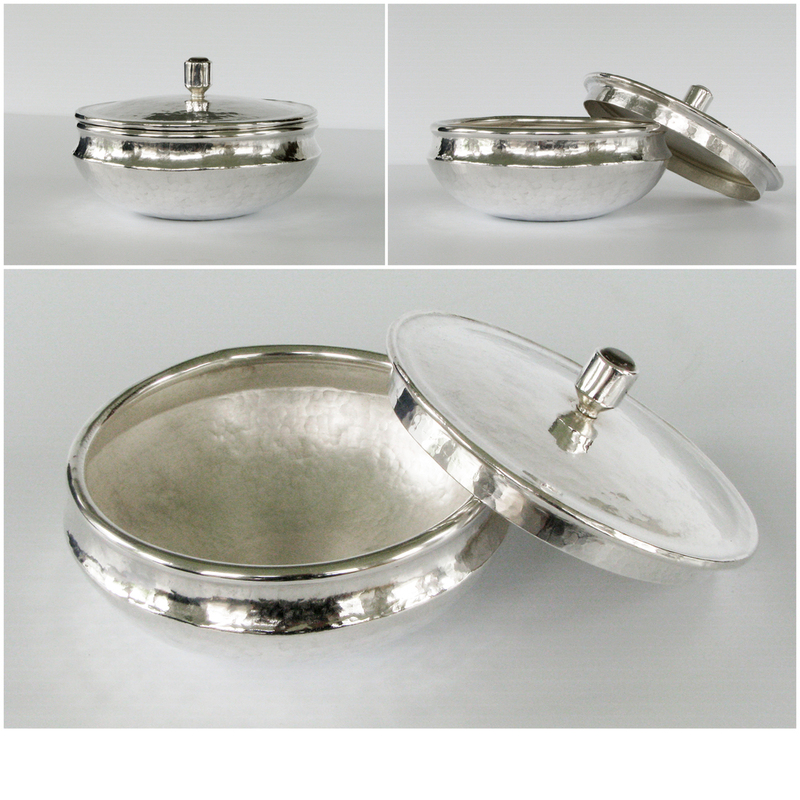 Hollow-ware is a specific type of metalsmithing that was completely new to me so I began learning the craft and principles required to hammer sheet metal into hollow forms. I studied numerous technical and reference books, demonstration videos, websites, and practiced on many pieces in copper sheet. 4. The vessel's design was to follow suit with the church's architecture and interior built in the Arts & Crafts style. Unlike Gothic churches, in the Arts and Crafts style elaborate adornment was to be avoided and symbolism was to be modest. I studied the work of architects like Greene and Greene, Frank Lloyd Wright and E. Fay Jones for visual and conceptual development before deciding that the stain glass window in the sanctuary would be the root source of ornamentation for all of the vessels. The drawing phase is a generative process that distills research and creates options. 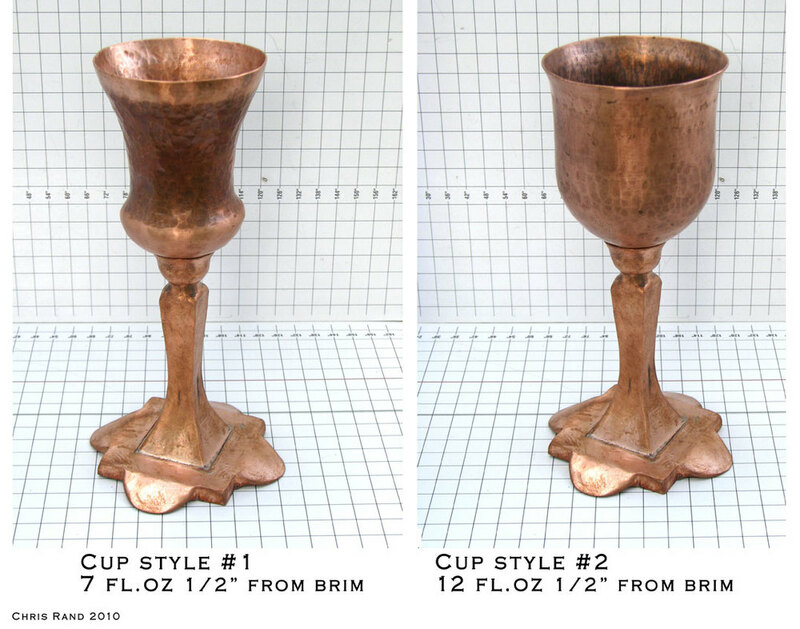 I determined the size of the chalice cup; considering both the capacity of liquid it needed to contain and people's feedback on what was favorable to hold, pour and sip from. Next, the size of the chalice stem was considered, followed by it's foot. I then created proportional grid paper to visualize all the pieces together in scale. This allowed me to simultaneously sketch and scale different options. Each vessel was drawn with this approach and illustrated in a series of three subtle variations (lower right image). As my science and arithmetic teachers would say, it is important to show your work. 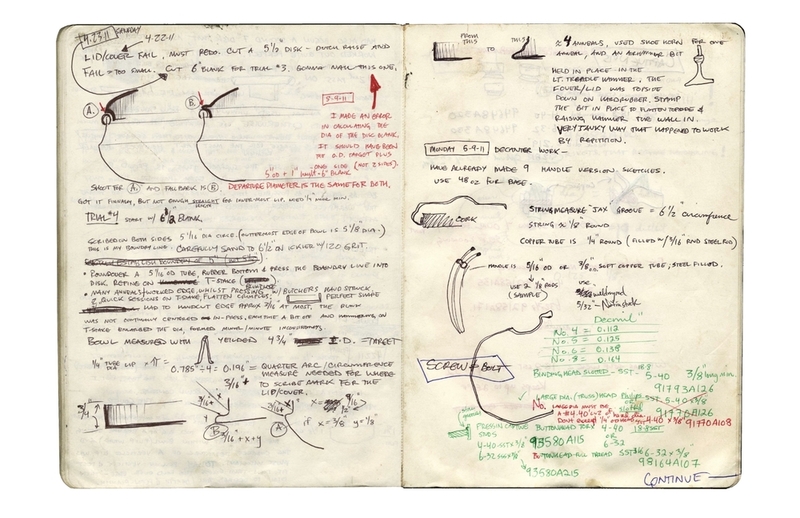 The lower left image shows hand-written notes based on the samples and prototype. 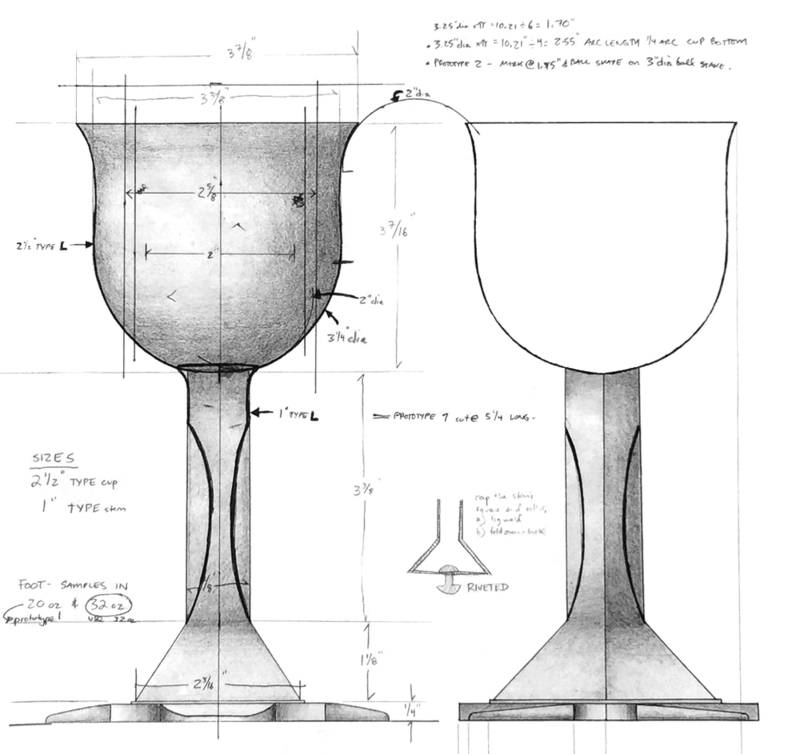 The final designs were presented as graphite drawings in full scale accompanied by prototypes of the copper chalice and paten. Symbolic to the custom nature of this commission, each vessel required me to make dozens of specialized tools that could withstand continual impact from hammering the copper into shape. From hardened steel punches, to hammers, dies and wooden forms, these implements are specific to making these unique vessels. By making samples and prototypes, I practiced and applied the techniques required to make each object. 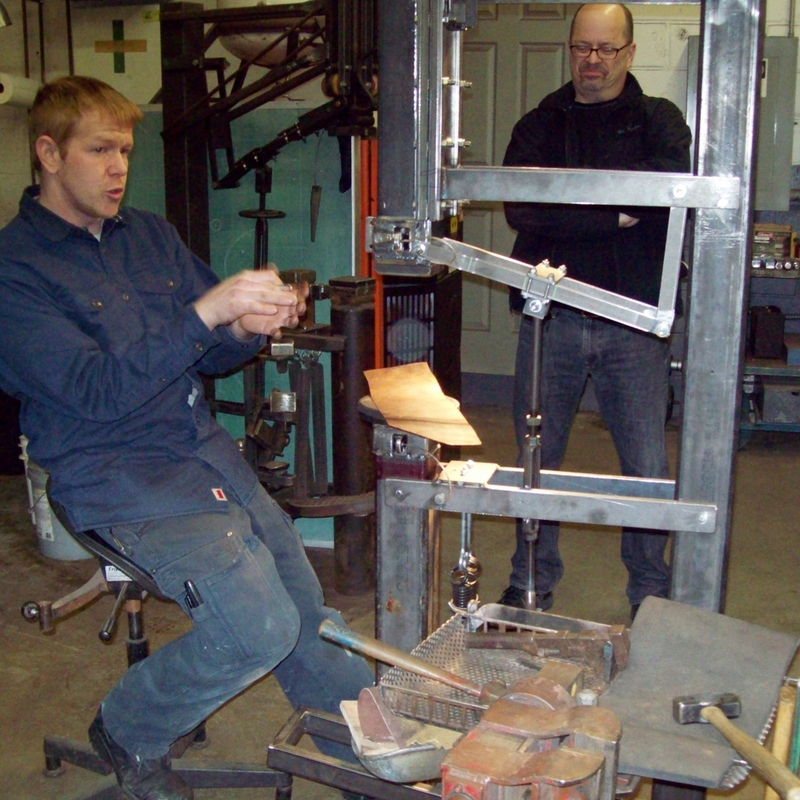 A full scale paten and chalice prototype was made to aid in determining the projects budget and timeline. When brought to committee meetings, these pieces were powerful in communicating just how the vessels could feel and look which expedited our agreement on the final design. During the process of forming practice pieces and a prototype bowl and chalice, I meticulously recorded notes, photographs and video. Because of this, I was able to rapidly learn the behavior of the metal, provide an accurate estimate of time and cost, get tangible feedback from people and effectively produce multiple pieces with consistent quality. Sharing with the clients what goes on behind the scenes provides them with a deeper understand of the project and thus heighten the value and their ownership of the results. I arranged studio visits, demonstrations and presentations at various times throughout this commission. 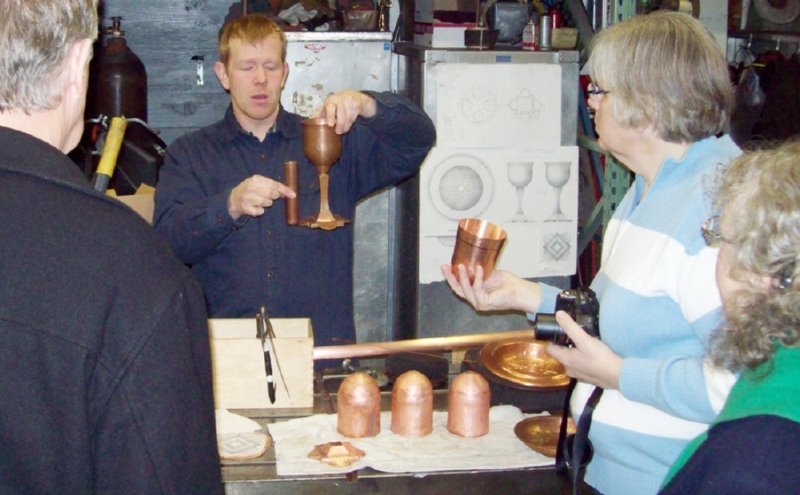 The finished copper vessels were plated in sterling silver and mirror polished. 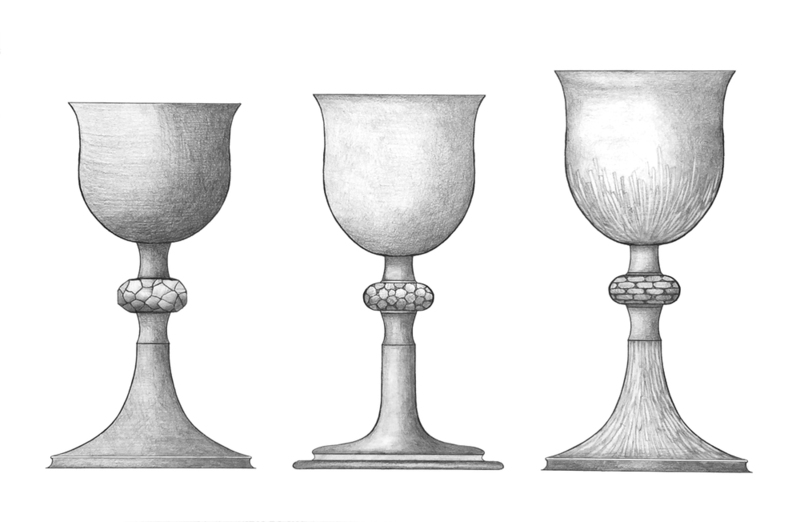 A fastening system was used between the cup and foot so that each chalice could be dissembled into three parts for ease of plating, cleaning and repair. Below are selected photos of the finished chalices, ciborium and the vessels being used during ceremony. A few weeks after delivery, I gave a presentation to the parishioners, at large, to describe the process and to answer their questions. It was the highlight of the entire scope of this very special commission. To everyone that makes up the community of Saint Cecilia, thank you !